Why do Toucans have Big Bills? Read the answer here! The feature the Toucan bird is most known for is its large, colorful bill. Looking at the bill you would think it is heavy but it’s actually very light due to being made from keratin. This is similar to the hard protein material that fingernails are made of. The framework is small, hollow bones. There are also a lot of air pockets in the beak resulting in a lightweight, though large, beak. Because of its light weight, 1/20th of the total weight of the bird, the toucan is still able to fly; a feat that would not be possible if the beak was as heavy as it looks. In recent years the brightly colored beak has caused the toucan to be seen as a comical cartoon character, especially Toucan Sam, the symbol for Froot Loops cereal. Though the beak provides a distinguishing beautiful feature for the toucan, there are also many practical reasons for its existence. 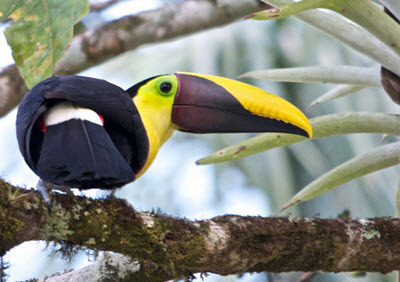 Toucans enjoy a variety of benefits from their large, beautiful and highly functional beaks. Though it is large the beak is rarely used as a defense weapon. It does somewhat act as a deterrent to predators due to its large, intimidating size. Toucans also use their beak to reach for fruit or other types of food that is a distance away. Some branches might not be strong enough to hold the toucan’s weight, but it can reach the food by using its long bill. The top of the bill, the mandible, is stationary and attached to the skull. A hinge makes it possible for the lower mandible to move so the beak can be used as tongs. Toucans like to toss their food in the air and then catch it. The beak is also used to peel fruit. Their long, agile tongues also assist in reaching for food. It is especially helpful in catching insects and lizards. Though the beak is brightly colored it also works as camouflage. Because of the many colored flowers and plants in the tropics the colors of the beak help the toucan blend into its environment. Scientists have recently discovered another function of the toucan’s bill. By adjust the flow of blood to their beaks toucans can adjust their body temperature. More blood to the beak releases body heat and makes them cooler. This means the beak actually works as the toucans own private air-conditioning unit. Since toucans, like other birds, don’t sweat; this ability helps the toucan survive the tropical heat. When blood flow is constricted to the beak, energy is saved and it keeps the toucan warm. Since there is little difference in coloring between the male and female it’s not likely that the attraction of the beak is part of the mating process. However, the beak is used to toss fruit back and forth between the mating couple. This goes on for several hours before the couple mates. Their beautiful beaks have also caused them some harm due to making them popular for capture by humans.